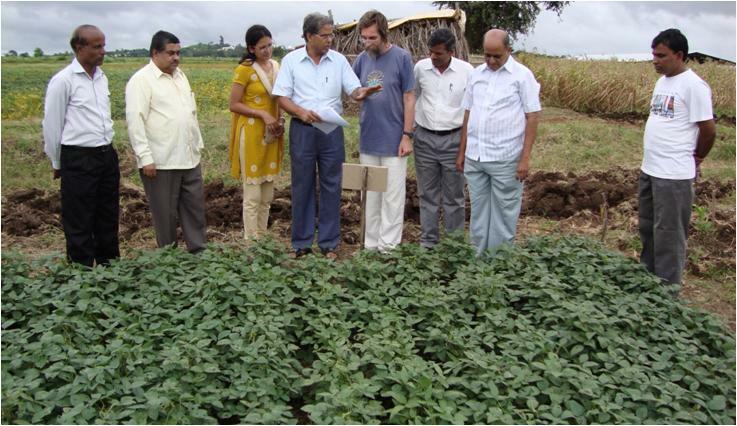 A lot of research work was done on the effects of Homa Farming on soil health at Dharwad Agricultural University, Karnataka, Southern India under the guidance of Dr. Pramod Basarkar. Four M.Sc. theses had the subject of Homa Farming – one each concentrated on studying growth, yield, disease resistance, occurrence of pests, and effect on soil parameters. Crops planted were soybeans, cabbage, tomato, and Okra (ladies’ fingers, a vegetable quite popular in Asian and African countries), one thesis each concentrating on one crop. Results were very good showing increase in yield, better quality of the produce etc. Today we want to just look at the effect of Homa Farming on soil quality, soil health. There were considerable improvements – although all these four studies were only carried out for one season! Would be interesting to see how the soil improves even further if Homa Farming would continue for a couple of years. The four studies examined nutrient content and biological properties of soil, mainly beneficial microorganisms. But did not go into physical properties like soil texture and structure, pore space, permeability, water holding capacity, etc.). Soil nutrients: normally there is a distinction made between macronutrients and micronutrients. Macronutrients are nutrients which are required in large quantities for plant growth. The primary macronutrients are N, P, K – Nitrogen, Phosphorus, and Potassium. Micronutrients are of same importance for plant growth as macronutrients – only they are needed in smaller quantities. Microorganisms: beneficial bacteria and fungi help to decompose organic matter in soil, fix nitrogen from the atmosphere, solubilize phosphorus, etc., and thus make nutrients available to plants. A soil without such microorganisms is dead – not really a soil in proper sense. Actinomycetes have characteristics of both bacteria and fungi. Their role in soil is mainly to break down organic matter difficult to degrade. Soil phosphatase activity plays a fundamental role in the transformation of P from soil organic matter into a forms available to plants. Following the change of soil parameters, especially soil microbial count and content of macro- and micronutrients, compared with control without Homa. It can be clearly seen that Homa Organic Farming improves soil quality in all the parameters measured. These results were obtained after just one season. It would be worthwhile to continue such a project and see how soil health improves within a longer period, say three years! This time we concentrated on the effects of Homa Organic Farming on soil quality.